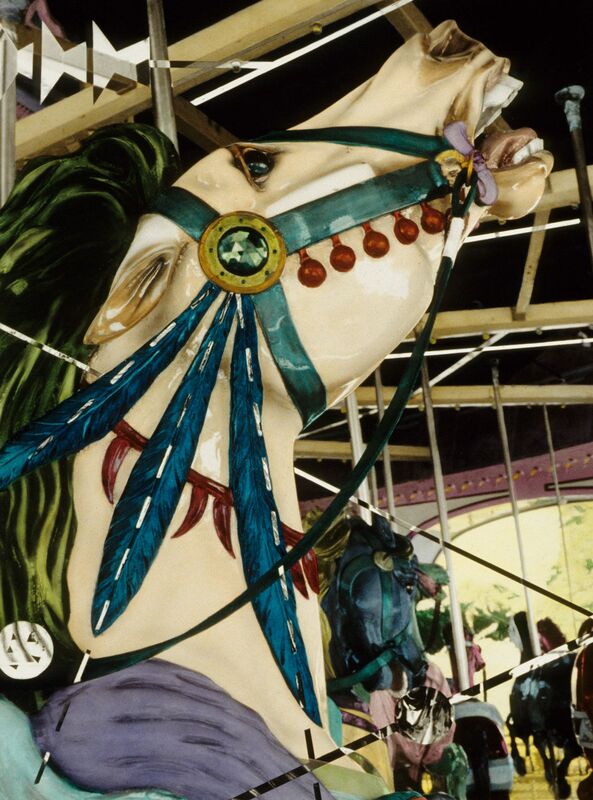 The structural quality of the objects is what first attracted me to my first series, “Fair Rides.” I chose not to photograph the individual ride as a whole, but to fill the space with close ups, zeroing in on parts and details. The linear design elements added to the surface of the photograph appear to float, dissect and divide space. S.K. List explained “Tracie K. Taylor makes complex, fine tuned manipulations on one marvelous hulk of a motorcycle,” in reviewing Unrestricted Color, “Content, Color and Process”, The Ithaca Times, February 10, 1983. The Mini Golf Series are landscape fantasies. Similar to the fair rides they are manufactured miniature versions of manmade and/or natural objects. Replicas that imitate the object reduced in size. It is very important not to allow real people to venture within the frame. This would give immediate recognizable scale, which I am trying to avoid. The figurative elements are added to instill a humorous and surreal quality to the subject. The Abstract Machine Series are ambiguous parts and details of 3 dimensional objects, found at salvage and junk yards. When photographed become a 2 dimensional system of pattern and design. The surfaces are illuminated by stark contrasts of highlights and shadows. The once dull and mundane used parts are embellished with intense hues of unrealistic color. Gardening and appreciating other manmade landscapes is one of my favorite past times. The Garden Series photographs include both close up details and larger views. The compositions are busy with information to disseminate and whimsical icons added for the viewer to search and find. My bold and bright choices of color as in all my work help to provide a mirage of what is real. Hakata and Geisha dolls were purchased as tokens or gifts by the post war service men to bring home to their wives and children. Being a Naval Officer’s daughter I remember fondly the porcelain, usually men Hakatas, that dad brought home from Japan. These delicate icons were always given a place in our home, hopefully out of the reach of small hands. There is only one, from my dad’s travels, that survived three children but luckily there were enough made in mass that they can still be found. The Geisha Dolls made of fabric and assorted embellishments, if purchased with the glass case, can still be found in new condition. But without the glass case many have yellowed and/or disintegrated over the years. Both the Hakata and Geisha dolls are still mass produced today but the craftsmanship is not what it was. I’ve been fortunate to build my own collection from antique malls and yard sales. To photograph them I place them in garden and put the camera at an angle to suggest they are much larger than their actual size of 8”-16”. I hope to capture their individual characteristic that borders cartoon and reality. Ms Taylor’s photo-paintings are in the collections of the National Museum of Women in the Arts, Washington, D.C., The Academy Art Museum, Easton, MD, Albin O. Kuhn Library at the University of Maryland, Federal Reserve Bank, Richmond, VA, Johns Hopkins Hospital, Baltimore, MD, WJZ-TV-13, Baltimore, MD, and numerous other corporate and private collections. In 2000 her work was included in “Gardener's Delight” and in 2006 “Vistas and Visions: Selected Landscapes from the Permanent Collection” both at National Museum of Women in the Arts, Washington, D.C. Her photographs were chosen for two “Current Works,” juried exhibitions at the Society for Contemporary Photography in Kansas City, MO. She has participated in over seventy shows at Steven Scott Gallery two of which were solo exhibitions in 1990 and 2000. Publications include The Official Marshall’s Handcoloring Guide and Gallery. The Tools & Techniques of Handcoloring Using Marshall’s Materials and Handcoloring Photographs. How to Create Color Images from Black and White Photographs and "HANDCOLORING PHOTOGRAPHS," by James McKinnis. Steven Scott Gallery has represented the artist since it’s opening in 1988.